The neighborhoods of Barcelona treasure a lot of streets, squares and buildings that you can not miss when you come to visit the Catalan capital. Today we are going to spend a day in the Gracia neighborhood in Barcelona, an area with bohemian imprint and artistic and multicultural character. We’ll go through the main points of interest so that you immerse yourself fully in this neighborhood’s life, a place that once was an independent municipality until the end of the 19th century. 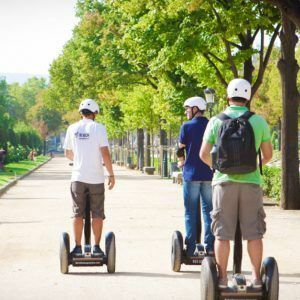 The Gracia neighborhood became part of the urban nucleus of Barcelona in 1897, but this place still preserves the magic of the city that one day was, so you will find many cool things to see and do. There are several squares you can find in the neighborhood of Gracia. The most popular is the Plaça de Sol, with terraces and cafes and with a lot of atmosphere during the day and, especially, at night. Another square, one of the most beautiful, and in which you will also find many people is the Plaça de la Virreina. There you’ll see the parish church of Sant Joan, and even you can dance some swing on Sundays. An obligatory visit when you are in Gracia neighborhood is the Plaça del Diamant, which conserves an anti-aircraft shelter from the Civil War, the Plaça del Nord or the Plaça de la Vila de Gràcia. Plaça de la Sedeta is currently an active civic center in the neighborhood and a symbol of struggle and neighborhood work since it is located in the old Pujol i Casacuberta factory, known by the name of this square. We now move to one of the most emblematic and visited places in Gracia: the Park Güell. This jewel is a work of Antonio Gaudí, and we invite you to walk through each of its corners. Its square is a viewpoint where you can enjoy the spectacular views towards Barcelona and, in the park, you will find nature, art and history. The construction of the Park Güell began in 1900 and some of its essential spaces are the Escalinata del Dragón (the Stairway of the Dragon), the Sala Hipóstila (the Hypostyle Hall), the Teatro Griego (the Greek Theatre) or the Plaza de la Naturaleza (Nature Square) that is currently under construction, el Pórtico de la Lavandera (the Porch of the Washerwoman) or the Jardines de Austria (Austrian Gardens). You can also enjoy incredible walks along its roads, streets and viaducts. Squares, parks and, also, buildings with history. The Gracia neighborhood is the cradle of some of the most representative modernist buildings of modernist architecture in Barcelona. One of them is the Casa Vicens, the first work of Gaudí and former bourgeois residence. It is located on Carolines Street. Another beautiful building that you will find on your walk through the neighborhood of Gracia is the Casa Rubinat, of modernist architecture, built by Francesc Berenguer Mestres, the right hand of Gaudí, in 1909. As a curiosity, the project is signed by Joan Rubió i Bellver, since Berenguer was not titled. Another modernist building you will have the opportunity to visit in the Gracia neighborhood in Barcelona is the Mercat de la Llibertat (the Freedom Market), located in the homonymous square. The space it occupied since 1888, formerly known as Plaza de la Constitución, was the place where farmers sold their vegetables, vegetables and other products. Now, you can focus on a whole feast of sounds, smells and colors within a building with iron and work structure, decorated with pieces of wrought iron, which was designed to protect the food and all things that were inside. And if there are not many people or you have time, you can taste some of the foods or dishes that are served in one of the stalls directly in the same market. Located in the upper part of Gracia, between the Coll and the Putxet hills, this viaduct is a civil engineering work that was built by architect Miquel Pasqual Tintorer. It was the first time that iron was used with reinforced concrete to cover with cement a construction at the bank of a stream. With this viaduct the cars and people could move from one side to the other and, in the same way, the neighborhood was opened to the rest of the city, favoring the connections. 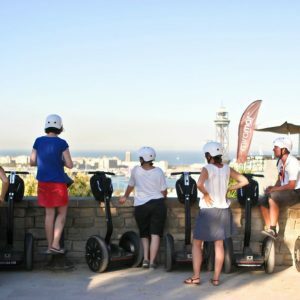 If you want to enjoy unbeatable views, we invite you to come to visit this point, one of the highest in Barcelona. The Gracia neighborhood of Barcelona has the honor to host the smallest theater in the world. It is located on Encarnación Street, number 25, and is located on the ground floor of an old farmhouse from 1890. It was opened to the public in 1999 and, in this place, there are concerts, shows and events, all on a magic stage and in a familiar and cozy environment. If you want to walk, Gracia is a beautiful place to do it. Streets are full of magic, and you can still feel the atmosphere of the old town it was once ago. In many of these streets, you will be able to see fun traffic signs decorated with stickers. On Verdi Street, for example, you will find a wide variety of restaurants with typical food from nearly every country. And if you want to change and visit the district of L’Eixample, you can walk along the Paseo de Sant Joan (last section of it) which connects both areas of Barcelona and was opened in 1929. Squares, buildings, streets and parks. The neighborhood of Gracia in Barcelona is a meeting place where you will find culture, tradition and art to offer you an unforgettable day by visiting one of the most iconic districts in the city.